Venezuela's Chávez Gets Rival In Presidential Race : The Two-Way Taking the primaries handily, Henrique Capriles said it was time to end Chávez's socialist experiment. Capriles says he admires Brazil's "modern left" economic model. Henrique Capriles gestures after wining the opposition presidential primary in Caracas, Venezuela on Sunday. Venezuelan President Hugo Chávez will face a young state governor in the October presidential election. 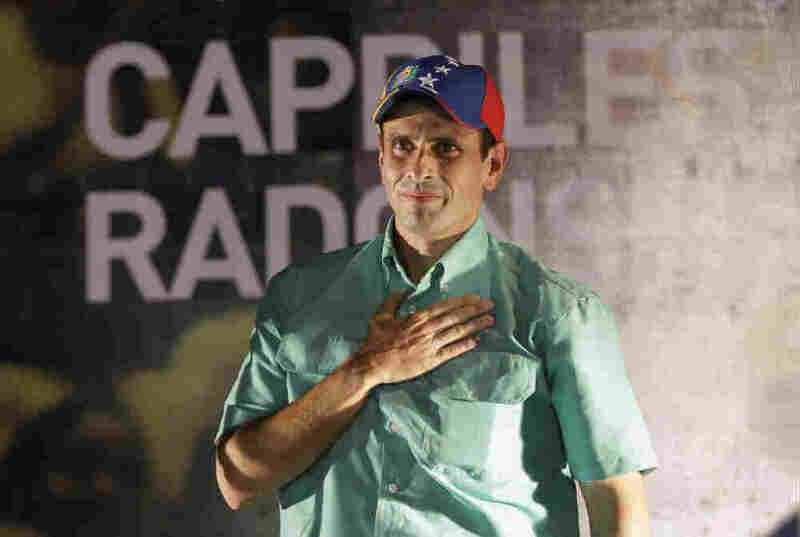 Henrique Capriles, 39, emerged victorious this weekend after the opposition held its primary elections. "The governor of Miranda state, which includes most of the capital, Caracas, won more than 62% of the vote and was immediately endorsed by the defeated candidates, who vowed to make him the next president. Jubilant supporters honked car horns, chanted 'unity' and waved yellow flags, the colour of Capriles's party, Primera Justicia. "'This is not the hour of the left or the right but the hour of Venezuela, of all Venezuelans,' he told a victory rally, repeating a non-confrontational, ideology-free theme aimed at the centre, a strategy partly modelled on Brazil's ruling party. "'This project,' he said, referring to Chávez's so-called socialist revolution, 'belongs in the past.' He called Venezuela a country in crisis, citing economic and social problems and political polarisation." Chávez has been in power for 13 years. The Miami Herald reports that a fractured opposition has helped him stay in power. But this time around, the opposition is vowing to unite behind one candidate. Reuters reports Capriles' opposition quickly endorsed him and the turnout was better-than-expected at nearly 3 million. "The grandson of Polish fugitives from Nazi persecution, Capriles says he admires Brazil's 'modern left' economic model, which has helped pull tens of millions of people out of poverty through a mix of state spending and respect for private enterprise. "He has promised to address the day-to-day concerns of Venezuelans such as high crime, unemployment and constantly rising prices, and spend less time on ideological crusades."